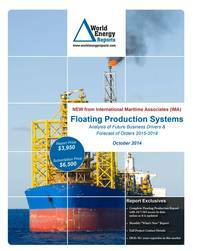 The October WER report provides an overview and profile of the floating production sector, examines the underlying business drivers for future industry demand and presents our forecast of production and storage unit orders over the next five years. The forecast -- which employs a bottom-up approach based on 230+ known projects in the planning stage -- is segmented into eight categories of floating production systems. In each of the eight segments we forecast the number of orders for additional units over the 2015 to 2019 time frame under three sets of market assumptions. An estimate is made for capital expenditure associated with future orders. 115 exhibits and three appendices contain details supporting the forecast.